We did it! Last few days and new stretch target added!! Amazing supporters, thank you so much for your donations! Your generosity has helped the pop-up to reach AND supersede its £5,000 goal! 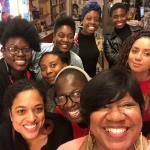 This is great news and it's all down to you and your belief in the need for a Black feminist bookshop! The crowdfunder is now in its last couple of days: it is due to end on Friday 1st March 11:46am. Because it's doing so well, I've decided to add a stretch target, which I know can be reached with your help. The extra money raised will mean that I can do more with the pop-up - such as buy additional books or run it for longer - so, share, share, share and give it one last big push!! Let's get your family, friends, colleagues, social media followers all donating! I know we can do it! PS for those of you who offered to donate books or your time, thank you, I'll be in touch soon! For those of you that have books suitable for the bookshop, please donate - the pop-up needs them! You can drop off your books at Housmans Radical Booksellers, Kings Cross or Blackwell's Bookshop, Holborn. Make sure to say that they are for the Black feminist bookshop.